Shower of Roses: A "Shower of Roses" Afghan Giveaway! Aren't giveaways so much fun? In addition to the St. Therese Faith Folder Giveaway, I have also been given the priveledge of hosting another (remember the tote bag from last year?) giveaway sponsored by Catholic Embroidery, in honor of the upcoming feast of St. Therese! One lucky visitor will win this beautiful "Shower of Roses" Afghan! Made of 100% Eco2cotton and woven with durability in mind, this blanket is the perfect accent over a couch, at the foot of a bed, in the car, over an armchair, or even around your shoulders. 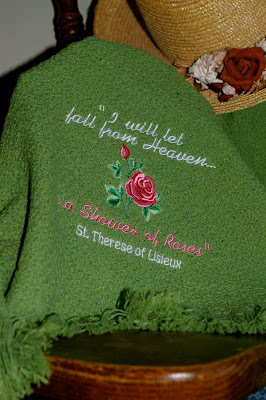 This mellow sage-colored afghan embroidered with the Little Flower's own words, "I will let fall from Heaven a shower of roses" and stunning Rosebud design not only wraps our homes in warmth, but our hearts too, with the confidence and hope that come from St. Therese's heavenly intercession. 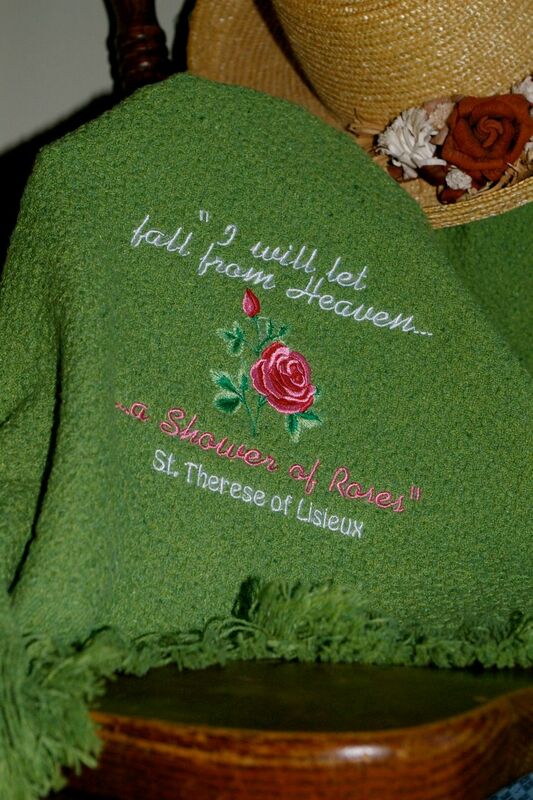 Please visit Catholic Embroidery's website and then come back and leave a comment on this post by Midnight on Friday, October 1st, the new feast of St. Therese. The winner will be chosen with a random number generator and announced here at Shower of Roses on Sunday, October 3rd, her traditional feast day! Be sure to leave your email address, or have it linked in your profile, so that I am able to contact you. This is beautiful! Thanks for the chance to win! This is so nice. I would love to win! It's so pretty. I would love to enter for a chance to win. I would love to win this. Thank you for sharing! I especially love the bookmarks. Thanks for the chance to win! I absolutely love their stuff! Count me in! I'd love to win - the color of the blanket is perfect for my living room love seat! Thanks, again! They offer beautiful creations. Wow - Little Flower patches! That is really cool! What a beautiful blanket! I would love to win. Didn't know about this site - thanks for sharing it with us! Thanks for this chance to win, Jessica. I would love to win this and give it to my second daughter for Christmas... she has such a sweet devotion to the Little Flower. That is beautiful. Thank you for offering the chance to win! What a lovely buiness! I've never been over there. Its been added to my list of places to shop for Christmas! Would love to win this for my daughter. October 3rd is my birthday! What a great site! I love the idea of individual Mass bags for children. Beautiful! Please enter me for a chance to win! Thanks! So Nice and UNIQUE!! Thanks!! So beautiful. :) Thanks so much for sponsoring this giveaway! I am a lover of St.Therese de LIsieux .I pray to her every day. Oh, how beautiful! Would love to win! Thank you! This Afghan is so beautiful! I've been praying to St. Therese that I pass my comprehensive exams for my PhD in theology this week with the final part coming on her feast day, October 1! st therese is always a favorite of mine. Count me in!! I love there items. What a wonderful item to give away. I love this! I think it would be really special to give to my daughters for the feast of st. Therese. They adore her!! Beautiful work! Thank you for the giveaway. Like Kristyn said, this would make a lovely Christmas gift for one of my daughters :) Thanks for the opportunity to win! Oooh, how beautiful! I'd love to win that for *my* Rose who's away at college! Thanks! What a beautiful Afghan! Reminds me of my mother. She loved roses too. When she passed away 15yrs ago we made sure there were roses on her coffin. It was beautiful. My grandmother loved roses too. I would love, love,love to win this Afghan. This Afghan would look lovely on my nursing chair! :-) Please enter me. I love it! Thanks for giving us all the chance to win it. I had the honor of meeting Mary and her family in St. Louis last spring and bought one of her beautiful aprons. I just love her products! Beautiful afghan! Thanks for hosting the giveaway! I headed over to Catholic Embroidery, but it looks like they're working on their site so we can't see pics of a lot of their products. Looking forward to seeing them- that could be a great site for Christmas gifts! How very beautiful! We would love to be entered and congrats early to the very lucky winner! Oh I would love to have this afghan. It is very lovely, and I know the people at Catholic Embroidery. They are a wonderful, good, Catholic family. 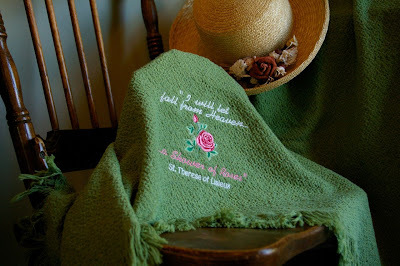 What a beautiful giveaway, I would love a chance to win such a lovely blanket, I have a special love for St. Thérèse of Lisieux, thank you! This is so Lovely! How beautifully made! Oh how beautiful. Put our name in for this one too. I would give this to my mother if I won it. what a precious afghan! and such a pretty color! What a beautiful afghan! Please enter our family into the giveaway as well. Please enter me in this giveaway. What a lovely afghan! Oh, lovely! I'd love a chance to win! Beautifully done! Winning would be so FUN! Thanks for hosting these giveaways and showcasing some of these fantastic vendors. I think I'm going to put a few of these things on my Christmas list. That is a beautiful throw blanket. I would love to win it! I would love to give this to sister whose confirmation name is St. Therese. Catholic Embroidery has such beautiful items at reasonable prices. Thank you for the link! St Therese has been such a dear friend to us, esp. recently, since my mom and I have been dealing with some very difficult times as of late. This afghan would be a delight to us both. Thanks for the Blog and the chance to win! The Ultra Portrait on their web site is amazing, I didn't know they could do this. Yes..I absolutely loved the Ultra Portrait idea too! gotta save up! ;) God bless and thanks! God gave her an incredible talent that she is using so beautifully! I hope I win that gorgeous afghan for my little Therese! How gorgeous! Thank you for the chance to win. Beautiful! And the Catholic Embroidery site is great (especially that Ultra Portrait!). LOVELY! Thank you for hosting the giveaway. St. Therese is my confirmation saint and I have a huge devotion to her. Would love to win this. I would love to win this blanket. St Therese is a very special saint for our family. Thank you so much! This is a lovely thing to do! I came to the blog today because I am going to share it on facebook for this day. I have a dear friend going through a tough time who would be the one I give it to if I win. Ave Maria! Just happened upon your site today = it has been a blessing. Thank you for the opportunity for the blanket. What a beautiful afghan! It would go perfect in my basement. :) Thank you for the offer. I know whoever wins will be very grateful. St. Therese, pray for us!